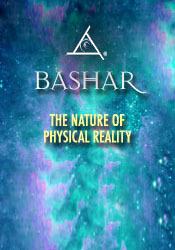 In this transmission Bashar covers the fundamentals of physics and what we call metaphysics. This session details exactly why and how we are the dimensions we believe we exist in, that reality exists inside us and not the other way around. But then he takes it in an unexpected direction, offering a permission slip that builds on the above and takes us to the idea of shape-shifting. Once we begin to understand the vibrational nature of existence in this way, a whole new world of possibilities opens up. The causes of allergies and asthma. Letting the environment dictate who you are. Cellular acceleration test used by the Greys. DNA markers in the Founders and humans. The importance of feeling grounded.